It’s Severe Weather Awareness Week in Florida, but regardless of where you live, weather awareness is best achieved through one little piece of hardware: a NOAA weather radio. You can get them in all kinds of forms — portable, desktop, alarm clock. 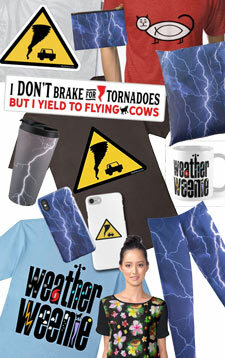 I have one in my car as part of the CB radio I use sometimes when chasing storms. I even have a weather radio app on my phone. The most important function of a weather radio is the ability to sound an alarm when the National Weather Service issues a warning, so you’ll always know if a tornado or severe storm is headed your way. This light, portable weather radio from Midland, the ER300, sounds alerts and has a variety of other functions. The radios broadcast local weather from the NWS all day long, not just warnings, but an alert tone is sounded when warnings are issued. Even when the radio is off, if set correctly, the alert will sound. Some radios can be programmed so they sound an alert only for your area and not other counties in the forecast area (look for S.A.M.E. or Specific Area Message Encoding in the product description). 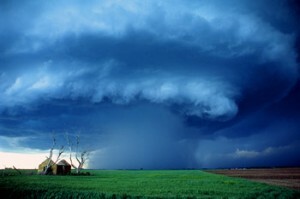 A small investment in a weather radio can keep you and your family safe. 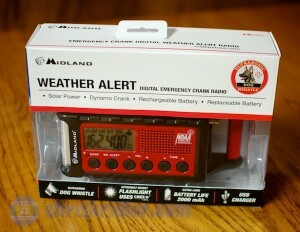 Midland makes several models of weather radio and sent me its ER300 for review. 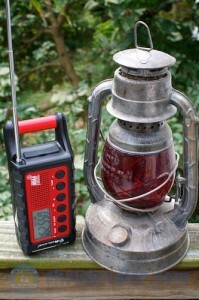 This portable radio’s multiple functionality appeals to my love of gadgets. First, it’s light (just a pound) and fairly small, with a handle, though it won’t fit in most pockets. It’s a natural companion for the beach or any outdoor activity as well as for emergencies. Once the radio is charged, the USB ports can be used to power your tablet or cell phone — again, a handy feature if your power is out for a while. We could’ve used something like this in the onslaught of 2004 hurricanes, when our electricity was out for days. I found the push-button controls fairly easy to use, though you’ll want to read at least the quick-start guide. The retractable antenna should be extended for best reception. The radio retails for $79.99. If cost is a concern, you can get a weather radio for a lot less (e.g. 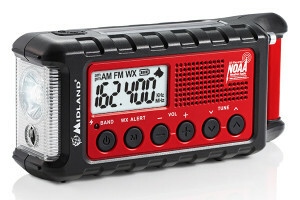 Midland’s HH50 Pocket Weather Alert Radio for $24.99). It’s worth it. It can save your life.